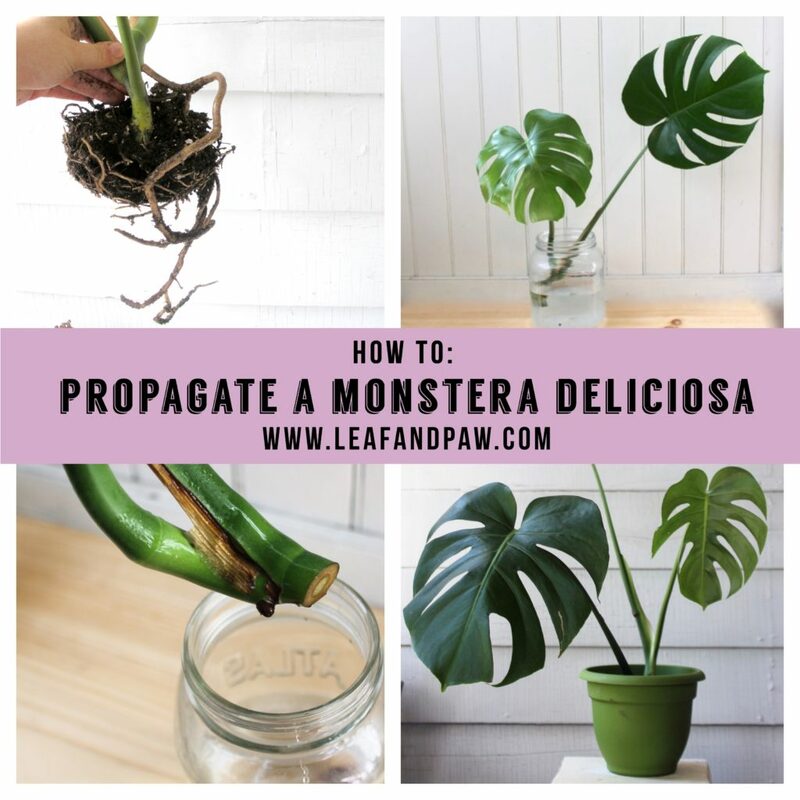 Want to propagate your monster Monstera? Look no further than this helpful guide from Leaf and Paw. Monty, my Monstera, became just too big in seven short months. Easily doubling in size, his leaves began to sprout every which way. Chaos ensued, and stems grew awkwardly horizontal. After repotting, he only became happier and unfurled another four leaves in a few weeks. Yes, of course I was a proud plant mom. I was the proudest mom in the whole world. But Monty was dominating my living room and I realized I had to do something. All of the above and cry. But Monty was too big. I had to do something. My love for all Monsteras is far and wide so I decided to strategically prune Monty to propagate him. Honesty, after pruning, it was the best thing I could do. The best part – more Montys! Plants (like people) grow and grow, but they don’t (like people) always grow the way you want them to. As Monty grew as wide as a boat, that gave me incentive to cancel his dietician and fitness coach and do everyone a favor and prune. This allowed me (to attempt) to make him the shape I wanted. The goal was taller, rather than wide. Also, since Monty was a very healthy plant, pruning actually encourages growth! And who doesn’t love the thought of having little Monsteras around. Now, I did my research on the best way to propagate, mind you, but I was still terrified. When I did propagating in the past, sometimes the cutting ends up moldy or shrivels – resulting in so many bad emotions. I was determined to not have this happen to Monty Jr.
With sharp sheers I snipped the stem to include an aerial root and node. The node is the little nub typically under the stem (it looks kind of like a plant pimple). After taking this cutting this from the main plant, I washed it under filtered water. If there were any extra leaves, this would be the time to remove them. Two to three leaves are fine, but remove any additional. I cleaned and filled a glass jar (no lid needed) halfway with room temperature, filtered water (chlorine is not good eats for young plants). I carefully positioned the cutting so it remained upright. You can always try a rig with twist ties or lean the plant on the jar lip to keep it centered. Every couple days or so I would quickly rinse the roots and supply Monty Jr. with fresh water. In about a month or so, I started to see good things happen. A new root, which would became the plant’s backbone securing it in the soil grew and that small node (remember that little nub?) grew into another aerial root. Monstera roots oddly grow circular, not straight down like typical plants. Keep in mind, I performed this surgery in mid-summer, so promptly placing Monty Jr in my humid, sunny, screened porch was I-D-E-A-L. And honestly, I would not attempt this in winter anyway, since plants become somewhat dormant and hibernate-y. Be a good person and don’t disturb them. I let Monty Jr soak in his bath for a good two months before planting. I used one of my good ol’ standby pots that’s plastic and sturdy, perfect for starting-out saplings. Filling lightly and not pressing the soil down, I put Monty Jr in his new home. He spent the rest of the summer-early fall on the porch, but as soon as the evening degrees dropped I took him in. New cuttings just seem like they would be more sensitive to influxes in temperatures, so I played it safe. I’m right, right? With the second cutting I did a few weeks later, after I had proven I was a capable parent, I attempted a take on an air layering method. After Monty Jr. worked out so well, Monty Jr. II (yes, that reads Monty Junior the Second) was cut off Monty the same way, but this time wrapped in moss on Monty rather than placed in water. 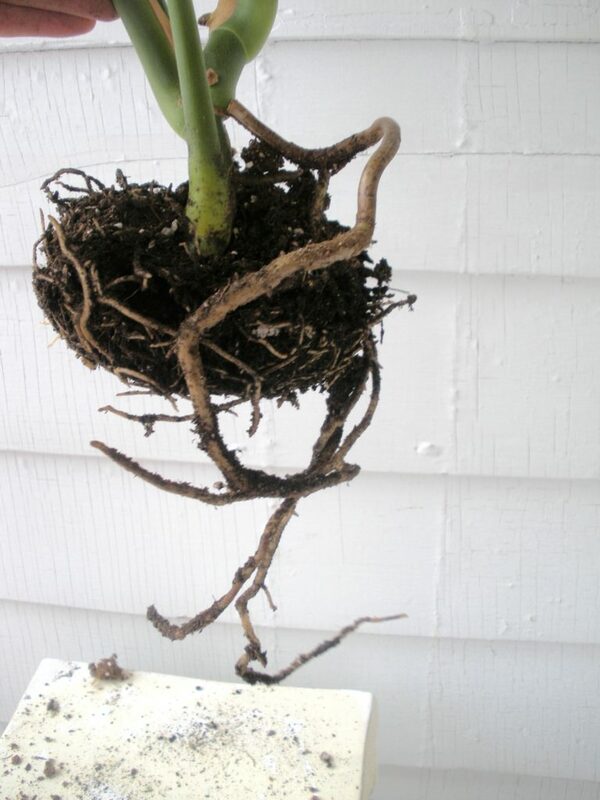 Air layering involves forcing roots to develop on the mother plant, then you can snip the stem off. Step 1: Assemble the hardware – you’ll need some sphagnum moss (note: do not use dyed moss, it will get all over your hands when wet and stain everything for days), plastic wrap, and twisty ties. 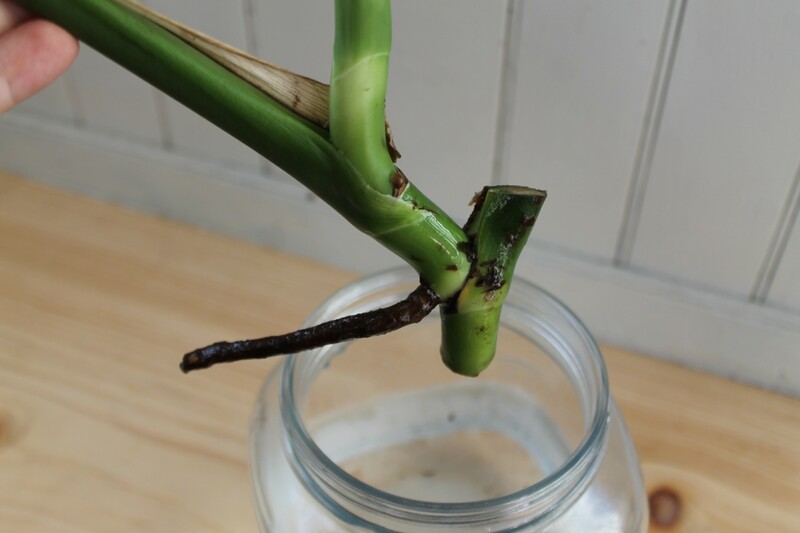 Step 2: Go ahead and make an incision cut on the monstera stem, include the node (or nub) – that will be your aerial root. The incision should be below all of this. Step 3: On the plant, wrap the node, any roots, and the incision with moistened sphagnum moss. Step 4: Wrap that bundle in plastic wrap and secure with twisty ties. This won’t be wrapped forever, and you should see roots really start to develop from the node in a couple months. Every few days, you’ll need to unwrap the root package remoisten the moss. A spray bottle works for this best, I think. In couple months, you’ll notice large roots have begin to grow on the plant in the moss package. Cut the stem clean off where the incision once was and pot away! Both mini Montys are happier than ever. They produce new leaves even though it is February and nature is dead inside. See above for the full roots that formed – cool right? Below is a new node developing on Monty Jr – it doesn’t take long! And how is Monty the Monstera doing? He still leans a bit to one side and is still the best cat-hiding spot in the house. Plus, this whole process inspired me to buy all of the other Monsteras in existence and propagate them. Share this post! Pin this pinnable pin, please. Check out L&P’s other propagation posts, too, on propagating Watermelon Peperomia and Rubber Trees. Hi!! Thank you for this wonderful post!! I’ve successfully propagated several (yay!). Does pruning encourage a bushier/more full momma plant? Mine is just starting to look a little stemmy, but still really nice, so I only want to cut if it will help maintain its full shape. Thanks for your advice! I’m so terrified of propagating my plant but your post made me want to try. But what happens to the mother plant (Monty)? I have a plant where there is only two places where new leaves grow so I’m afraid that then I propagate it will now only have one place where new leaves will grow. Hi Marie! I suggest not propagating unless you have multiple steams that have multiple leaves, not waiting until you have a few stems may result in killing the plant. Without seeing photos I can’t be sure, but I’m thinking you may need to wait a bit longer. Feel free to send photos to my FB page and I’m happy to take a look! Hi! Thank you for this post! I recently tried to propagate a cutting from a monstera and it was super happy when in a jar of water. When I potted him he got really droopy and sad and seems to be turning a lighter color. Is it too late to save him? Do you have any advice? Hi Alex, usually a lighter color means there is a watering issue. Does the soil have drainage? Is it overwatered? Make sure your cutting is in a bright location without direct sun, and also some place warm. Also I would check for bugs as new cuttings are very prone to bugs. Feel free to send a photo to L&P’s facebook page for more help! Hi, After reading your post on Wednesday I decided I was smart enough to take a cutting from a monstera in my office. I was wrong apparently. I did not take any of the stem where the leaves were branching off, however I did take an aerial root and a node. In your experience, do you think I could still see results? Hi Alison! You should still be fine. As long as there is some kind of root/node and a petiole/leaf, you should be ok. I would place that guy in water for a while though, you’ll want to see nice root development before you plant. Unlike most monsteras I see, mine only has two stems.. it has one quite long stem with loads of petioles along the length of it, making it look pretty awkward. So when guides tell me to “find a stem” – well. Is it okay to propagate taking the top node (which has two petioles with leaves) of the main stem? It would be leaving the mother plant looking a bit weird, I’m sure, but hopefully it will keep growing. I suspect my plant might not be getting enough light, triggering the weird growth pattern (it’s been reaching out vertically), but I’m trying to correct that. Does you cat try to eat your monstera? I read that they are toxic. I have a cat that enjoys chewing on my plants, and am concerned about his taste for greenery as I introduce new species into the household. How do you deal with that? Hi Diane, I do not have problems with my cats eating any toxic plants including my Monstera, which is why I have (slowly) incorporated them into my collection. If you have cat who does like eating plants, I would stick with pet-safe plants only. How do you know what size pot to use? I bought a cutting and it is doing good. It has 3 roots growing off if it. It has been I water for about 2 months is it time to pot it? It depends on the size of the cutting and roots generally, Shannon. With three new roots, I’m thinking a 6″ pot should be good and yes, after 2 months it should be ok to pot up! Hi! Should the cuttings get the same amount of light as the parent Monstera, or more / less? Mine has been doing beautifully in my living room, and I’m having a similar problem to you! I’d like to have two cuttings to trim it back and give away to friends and trying to figure out the best way to do that. Hi Adelaide! I kept my new cuttings (both in the water vase and after I planted them in soil a few months later) in a warm bright location which definitely helps with roots growth and development. Mine are in an east window so they get a decent amount of sunlight a day. Hope that helps! thanks for the great instructions. This spring I will propagate from a 40 year old Monstera that has been growing in my living room, having regrown 20 years ago after being cut down to the soil level. Now is 8 feet tall and a little wild despite regular prunings. In order to get a full looking plant, should I plant 2 or three separate cuttings in one pot (after rooted in water for a few months,) or should I rather limit the planting to one cutting per pot? Hi Terry, 40 years old? That’s amazing! For grouping plants, it depends on how big the cuttings are. 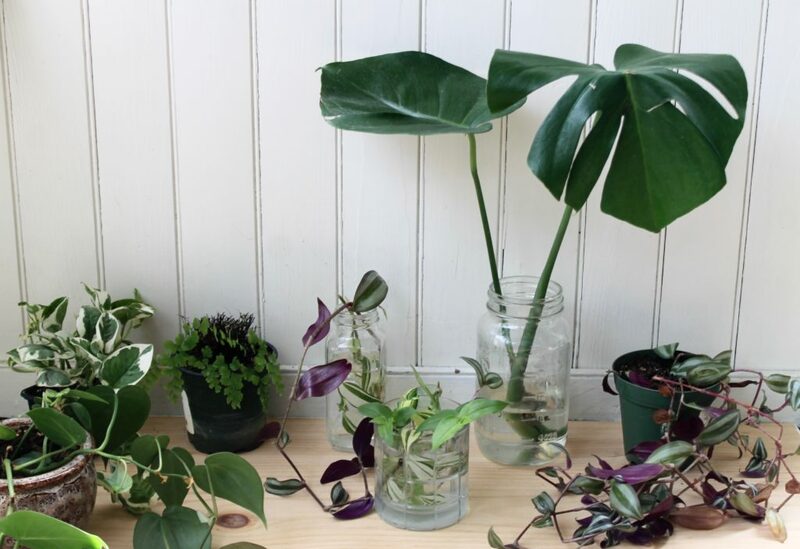 Considering it seems like the Mother plant is a large Monstera, I would keep each cutting to one pot each. They just tend to grow better by themselves, plus Monsteras do grow quick! Good luck! Thanks so much for this post! I got a cutting about two months ago and put it in the jar per your instructions. It’s so happy and roots are coming out everywhere! The new roots are about 1.5 inches long now and I feel like it’s time to put into a pot. I’m a little nervous about it though. Can you give some more instructions about potting? It looks like you used a post to keep the plant upright? How frequently should I be watering after it gets moved to the pot? I don’t want to ruin the little beauty! Congrats Megan! You can definitely pot now, but it never hurts to keep him in water until a longer root forms, I think Monty Jr.’s were about 4″ long when I planted. As far as planting, I potted him in clean moist soil (see the shop page for the soil I like to use) and I used whatever I could to keep him upright – like a stick and twist ties. Watering depends on lighting and current season, so I would keep him in bright light and start watering once a week but check the soil every day. You want moist but not dry or sopping soil. Hope that helps! You might want to take a look at your air layering technique. Air layering is done on stems still connected to the plant, you shouldn’t cut an air layer cutting until the roots completely form. Just wrap the moss around the stem and cover in plastic and leave. It should finish in just about a month. Hi Tyler, I do specify that air layering needs to be done on the plant itself until roots form, but I appreciate your feedback! Hi Kossondra, Depending on where you live, you can purchase a Monstera online (Amazon had them here) and have it shipped to you. I know a lot of people have trouble finding Monsteras, so I often recommend just purchasing a small or medium-size plant over the internet to get them started. Also, you can try asking those local nurseries if there is a way to order one for you, usually they buy bulk plants from a larger tropics company who will sell them. Hope that helps! Wow, I love your blog! I was wondering if I could use Spanish moss in lieu of Sphagnum moss. What do you think? Thanks Nicolas! They are not quite the same thing as they come from different plant families. Spanish moss is part of the air plant family and will not hold moisture or function like sphagnum moss (which is an actual moss) will. You can definitely try it, but it is definitely not a direct replacement and may not work. Thanks so much 😊 I have s Monty that’s so healthy but getting out of control but was terrified to try propagating. I’ll def give it a go now. @Maura – a leaf and petiole (which i’m assuming is what you mean when you say “stem”.. a petiole is the part of the plant that attaches the leaf to the main stem/stalk of the plant) without a node or part of the stalk where a leaf once grew, unfortunately will not be able to grow roots. For those asking about toxicity with pets – aroids are much less toxic than many websites have led people to believe.. the calcium occalate crystals in monstera and other aroids can indeed cause discomfort in the mouth of animals/humans and could possibly make them throw up if they ate/digested a significant amount but they would have to actually consume almost an entire plant, not just chew on it, for it to cause any serious problems.. and like I said before, the crystals cause discomfort in the mouth and do not taste good, so your pet would have to be massochistic to continue munching on a plant that wasn’t tastey and made their mouth hurt. My cat chewed on a leaf of my monstera once.. and she hasn’t chewed on another plant in th house since.. and I am an avid aroid lover and am always on the hunt for plants to add to my collection, so I have aroids absolutely everywhere in my apartment. But ever since she chewed on that one leaf, I never have to worry about her when she naps behind my plants or hits one with her paw to watch it move, because although my cat likes to bite absolutely everything, she has never tried to bite one of my plants again. Hi! Thanks for this article! A friend gave me a monstera cutting on Christmas. I’ve been letting it sit in water since then and have some new roots! But also two leaves are starting to yellow. What should I do?! It’s winter so I wasn’t sure if it was a good time to pot. The new roots are about a half an inch. Thanksss! Hi Alexandra, how many leaves are on the cutting? Sometimes it’s common to see a few turn yellow. I would still let the plant sit in water another month or so, and you want to be sure it’s not near any drafty windows or cold temperatures, which may actually be the cause of the leaves coloring. By February, you should be able to replant, just be sure the cutting is in a warm place with lots of humidity (you may need humidifier as winter is drying). This article is so helpful! I’m wondering if I’ll be able to propagate a leaf that came off while I was repotting my monstera today? It’s really struggling and only had 3 leaves despite being 2 years old and I’ve place the broken off leave stem in water, but there is no node. What do you think of my odds for success? Hi Maura, You won’t be able to propagate it, but it will look lovely in a vase for a few weeks! You’ll only be able to propagate with a pre-existing node/roots. Thanks for the great information on Monstera propagation! I also wanted to add to your comment about the wandering Jew plant. I believe it is toxic to pets. Thanks for sharing, I recently got one and the leaves (young leaves) are turning yellow while the big ones are getting brown spots. any ideas as to what I’m doing wrong? Hi Natalia, it could be a few things, but it sounds like improper watering. Monsteras like to dry out between waterings, so the best thing to do now is check and see if the soil is moist/wet. If so, let it dry out and make note of how many days pass until it’s dry. Then water, and repeat this process for a few weeks until you get the hang of its watering schedule. Trim off any yellow leaves. Also check for bugs on the leaves and stems. This pest blog post might help. Good luck! Hi! Thank you for your great article! I actually got directions from tris article a few months ago in order to propagate my monstera. It worked beautifully! The parent was getting wild-looking due to the stems spreading and the new leaves shooting up in all sorts of directions and then the leaves started getting really small! So I decided to take cutting to condense the parent and also to get more plants. As I said the propagation part was easy as pie! However…. the new leaves are also small. Like the parent plant the new leaves are smaller than the old leaves. Any way to get the leaves bigger? It’s indoor and I have one of those purple grow lights on it to supplement the nirthern facing window light. Hi Elizabeth! So happy it helped you out. The leaves will be small for a bit until the cutting becomes established. If it helps, Monty Jr is about 14 months old and is just starting to get bigger leaves with small holes. It takes some time, but you’ll see them soon! 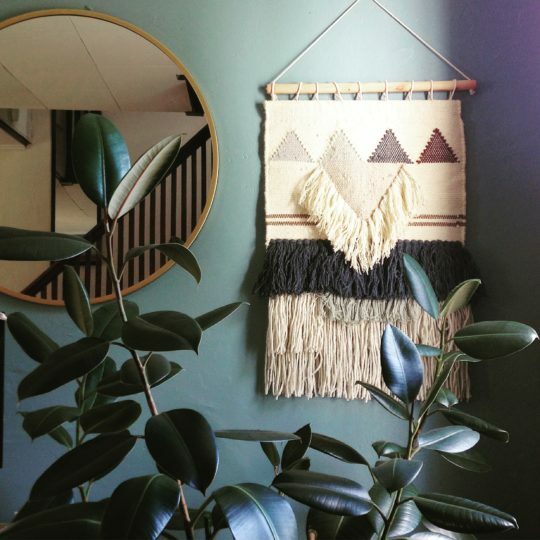 Can you tell me what is the plant with the purple leaves from the picture you posted above called? I have one, I adore it but I don’t know anything about it. Hi Alina – that’s a tradescantia zebrina, or Wandering Jew. They’re very easy to grow and propagate well – and are safe for pets! Hi, I’ve just repotted my Monstera that was quite a young plant that was originally a cutting, but I accidentally broke off trunk only leaving a small trunk stub and roots no leaves, do you think it will recover? Hi Narelle, It should. I currently have a monstera adasonii with no leaves, just a trunk and a few roots. It is VERY slowly growing new leaves and is recovering. Give yours time and plant it in a high quality nutrient-rich soil, place in a bright sunny location, and be patient. Good luck! Thanks for a great article. 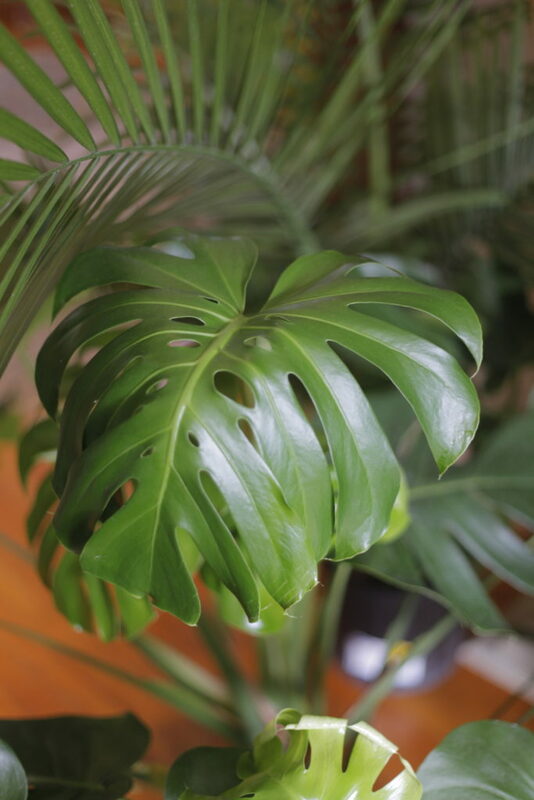 My Monstera is very happy – 5 feet tall, huge leaves with 20 cuts, a new leaf every month lately – but only a single stem. He’s indoors in a huge northwest window. Any idea how I can encourage him to grow bushier? Hi Abby! He does sound happy! To encourage wide growth like Monty you’ll want to do some trimming. I may need to see what the stem looks like, but you’ll want to at least cut a chunk off the top – this will encourage side growth. Plus you can propagate the cuttings. He won’t grow any way other than up unless he’s cut down. Hope that helps! Sorry that’s my right email below! I’ve managed to propagate a menstera and it’s doing well but there is only one leaf and it just grows bigger and badder but with no new leaves. Did I miss out on the aerial root? Will I just have one giant monsters leaf that continuously grows? Hi Kait! As long as your Monstera isn’t dying or the leaves aren’t drying up/turning black, you should see some root form soon as long as there was a node. If there was no node, you may not have any luck. Photos might help the best for this, so feel free to send me pics on facebook! Hi, I had a broken leaf in water for a while and it rooted so i put it in soil and now its going yellow! is it going to make it? should i take it out of the soil and out it back in water? please help! Hi Margo, is the leaf going yellow or the stem? Leaves turning yellow isn’t uncommon in Monsteras, but if the stems are yellowing you make be overwatering or it may not be happy. I would place it back in some clean filtered water until you see new root growth and improvement. I’ve been thinking about propagating my monstera but I wonder – what will happen to the mother-plant? Will it stop growing at all and just stay the way it is after the cutting? Nope, it does not hurt the mother plant at all, it actually helps! That’s as long as the mother plant is established enough first and healthy. The spot where you eventually do the cutting ends up producing and off-shoot stem, which then grow leaves. Hi Debbie – you won’t be able to propagate from just a leaf and stem. 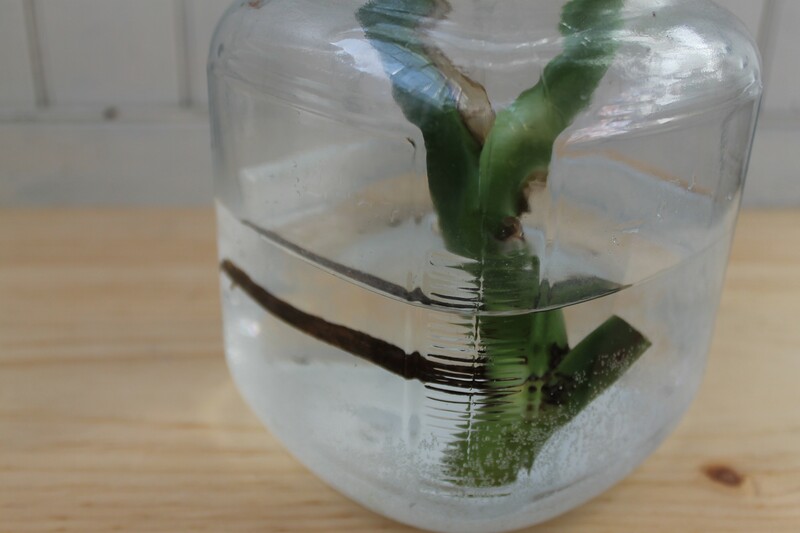 The cutting will stay green/alive in a jar with water (like a florist’s cutting), but won’t sprout roots. You may have to get another cutting, this time with a little node or chunk or root which will then continue to grow. I hope that helps! 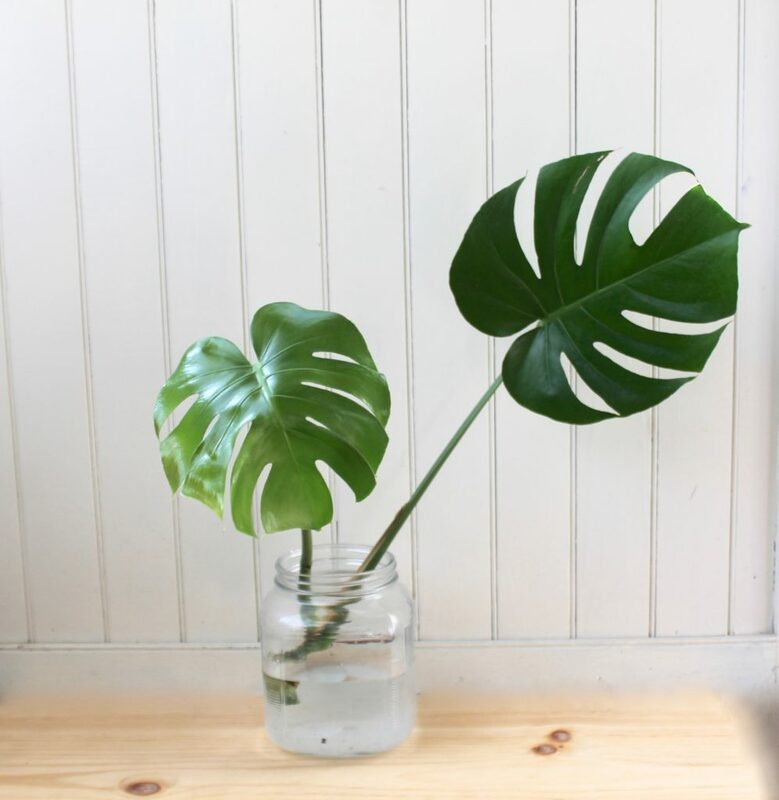 I have Monstera growing in abundance outside can I try propagate this or are there different types of Monty’s (indoor/outdoor)? Hi Jo – there’s only one type of Monstera and they can be grown indoors or out. I know they grow much more rapidly outside and you can definitely try propagating. Just make sure to pick a nice healthy chunk. Good luck! Hi, thanks for a great article! I have a monstera with several stems and is growing all kinds of new leaves. How do I know where to cut off the leaf if I cannot see many arial roots? Hi Lauren – thanks for reading! 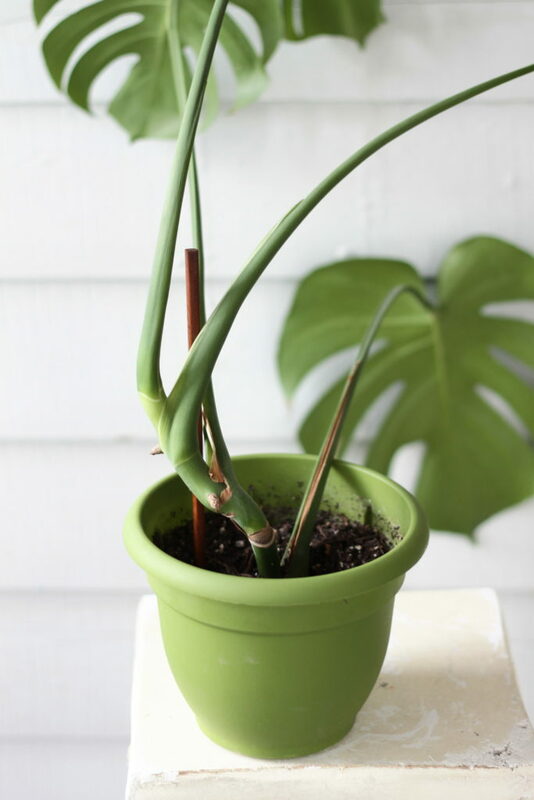 Your Monstera sounds very healthy and with that many leaves you should see some nodes along the stems and you’ll want to cut right below the node. Feel free to send photos to L&P’s Facebook page of you need more help! Hi, I recently got my hands on 2 fairly unhealthy variegated monstera plants. They’d been outdoors and neglected (in a bad way) and trimmed without care etc. I have them now in soil because they do have a big woody root system going even though the plants look terrible. I’m so scared they’re gonna die! 😫 I’ve found no great advice from my local nurseries. Is there any chance I could send you some pictures of these babies and you could give me advice? I’d happily trade for a cutting or a propagated baby if/when we get to that point! Hi! I *love* your advice–I live in South Africa, which loves its Monsteras, and my boyfriend’s got a huge one mysteriously growing up and around the stem of a giant jacaranda tree. The tree’s growing out of the driveway, and it doesn’t get a lot of water *and* is in a generally unloved area, so I’d love to propagate it! A couple Qs, though: 1) can the Monstera be put outdoors? We have coldish (0 F), dry winters and dryish summers, and it can get really hot in the sun. Then, 2) As it’s grown into the tree, this Monstera’s root system is pretty strange! Two branches have what look like nearly a DOZEN aerial roots, and another has one giant aerial root, but it’s partly embedded in the tree, and I’m worried I’ll kill it if I slice into it. I’d love to post a pic, but I don’t see an option on the site! Thanks so much. Hi Eve! That’s amazing! 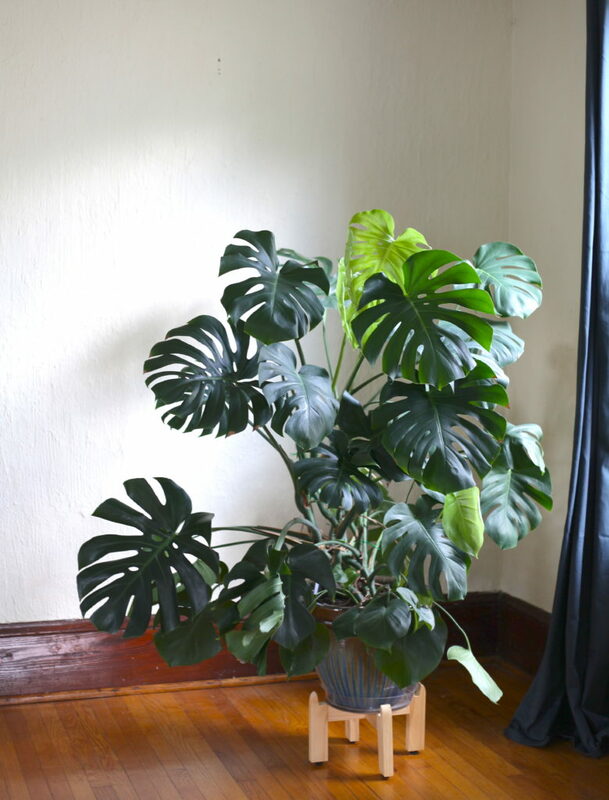 To answer your questions: 1) Monsteras are topical and will die below 40 degrees Fahrenheit, so I recommend putting outdoors in spring/summer/fall and bringing in during winter only. 2)You should be fine, as it sounds like a very mature and healthy plant. I would love to see pics! Feel free to post them on leafandpaw’s facebook page and I’d be happy to offer more help! Great article, I’m just wondering if you use rooting hormone? Hi Anastasia, refreshing to find your page on these beautiful plants. What I am wondering is is there a way to prune them so that they get more bushy and the stems then produce even more leaves lower on the plant? Hi Jim! The only way (I believe) they’ll get bushier is with more stems, and more stems are produced by ideal conditions such as bright light and high humidity, and rotating them weekly – that encourages even growth all round. You can also do trial and error and see if pruning many of the tall leaves results in more lower leaves, but you run the risk of stunting growth. I hope that helps! Hi, I thought the point of air-layering was so that it could grow roots while on the main plant, and then you would clip it off once the cutting had roots? Hi Jackson, the method I describe is considered a type of air layering, but yes, the method you mention definitely is. You can try to propagate on the plant itself, but I haven’t had luck that way. In dividing up my monstera, I ended up with some roots. Roots not attached to stem or leaves. Will monstera grow back from roots only?? There’s no harm in trying, Robert. I would let the roots sit in a glass water jar and just see if something happens. If the roots get moldy or start to disintegrate, I’d say get rid of them after that. Thank you so much! Propagating Mona my Monstera for the first time using your technique. Fingers crossed! I have a monstera growing vertically with single thick stem. The stem is almost 2″ in diameter. There are a lot of aerial roots and 4 big leaves on the top. I want to cut that stem short and replant the monstera but am scared of killing it. Also, since it os growing vertically, I do not see the nods like the one your Monty has. Please help! Hi Parul, I would wait. 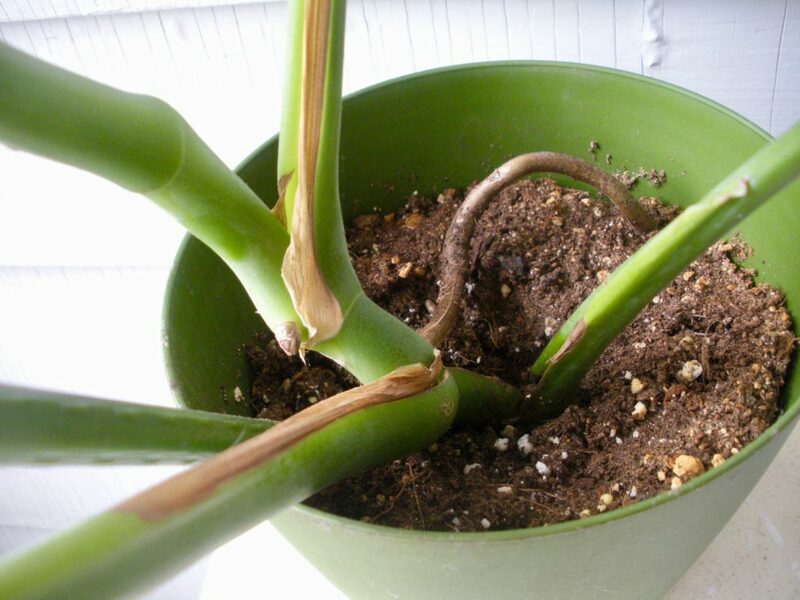 Your monstera sounds a bit too young to propagate, usually you need a few stems on a plant or else you may end up doing some damage and it may not recover. I’d wait 6 months or so until more stems appear. If placed in a bright location, monsteras grow very quick! So I live in Christchurch,New Zealand but grew up in Cali for a number of years with monstera’s all around me. They are a bit rare here (cold!) but I have finally aquired one again but it has been stuck in a way to small pot and is really tall. Can I propagate to try and start over and grow wide? HI Sammi, I would just repot it! Break up some of the roots and replant loosely in a pot a couple sizes bigger. I would repot first, then once he is acclimated to his new house, you should be able to propagate. Hello! Thanks for the helpful post! I went on a 10 day vacation and came home to find that my monstera had grown a lot and sprouted several new leaves. However,the stems/leaves have fallen over and new branches are growing weird directions. Is this just because the new growth is making it heavy, does it need more water or maybe it needs reppotted? Any tips and advice would be great! Hello! I just got a clipping from my friends monsters and it has a really long aerial root is it okay to cut it to make it a bit shorter or is that a no no? Hi Melissa! Congrats – that’s a healthy clipping! But I would not cut it. What I do is wrap the root around (when you go to plant it) in a circle to match the diameter of the pot, so a giant root isn’t just hanging down. I hope that makes sense – let me know if you need more clarification. Good luck! Hi Jerry, you definitely could as long as you had enough room. Because the roots grow so unwieldy, enough space would be the only issue, but if it’s a large pot you should be fine. Hi is the node you’re talking about the couple cm long little black bit sticking out in your pictures? I have never propagated because I get confused by what parts are what and what they’re supposed to look like.. thanks! Hi Angel! Yes that is the node. In this post I actually have an illustration of a Monstera unrooted for reference. Hope that helps! Hi, i recently bought a monstera plant at a very low price as some leaves have holes eaten by worms. And i noticed there a few tiny worm crawling in the soil. I am thinking if i should repot the whole plant or propagate from part of it. If there is node found, does propogating with ariel roots work? Hi Janelle! Congrats on your find. I would definitely repot. Take the Monstera out of the soil and discard it. I would then rinse the roots well under water and inspect them for damage. Pot in new soil and monitor for bugs. I would definitely wait to propagate it until it has healthy growth. Good luck! What a great article and forum with so many tips. I’ve found 3 neglected monsteras in my garden. They all seem very old with big beaches and stems (some branches are brown and woody-ish). and already has a long established aerial root, rooted into the ground. I would love to bring this one indoors. Can I cut it below the stem and with the long aerial root? But this means I have to cut the root to free it from the ground. I’m so worried I will kill it and waste the cutting. Thank you Meng! Is there any chance you can dig up the root? Otherwise you should be fine cutting it, as long as you take a piece/stem that has a few nodes as well. I would place the cutting in a glass jar with water until that root acclimates, then you should be able to plant and bring indoors. Feel free to share photos on L&P’s facebook page if you need more help. I’m looking to propagate my monstera plant as it seemed to be root bound and have stopped growing. All the nodes have grown long and has a protective layer around them. If I propagate my plant do I trim the long nodes then cut to propagate? Not sure what to do as I do not see any more baby nodes. Hi Diana! There should always be baby node, but yes you can cut a stem with one of the roots. I would let the cutting sit in a glass jar with water before you plant, for maybe a few weeks. 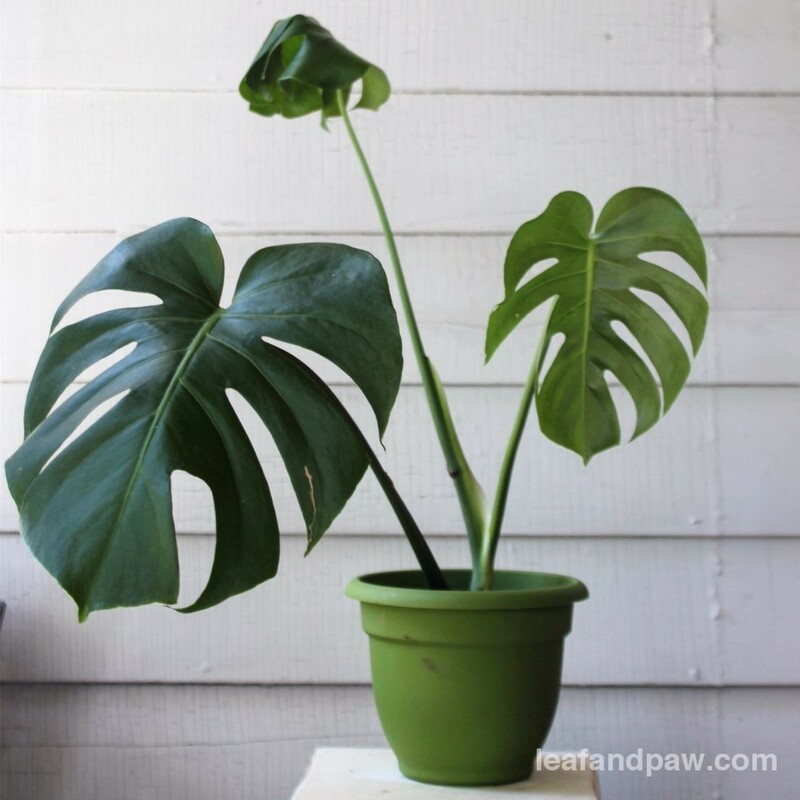 From the sounds of it, you Monstera might be better off getting pruned quite a bit and benefit from a repotting. A plant should never stop growing and it definitely sounds pot bound. 🙁 Good luck! Hi just wondering what happened to the branch on the mother plant? Did that stem grow back? Or did it just dry up? Hi Yin – the branch actually just hardens over – but I do have several new smaller leaves from it, though. The stem will never grow back fully, but depending on where the cutting was cut, you’ll probably end up with some more leaf shoots that will hopefully become branches. 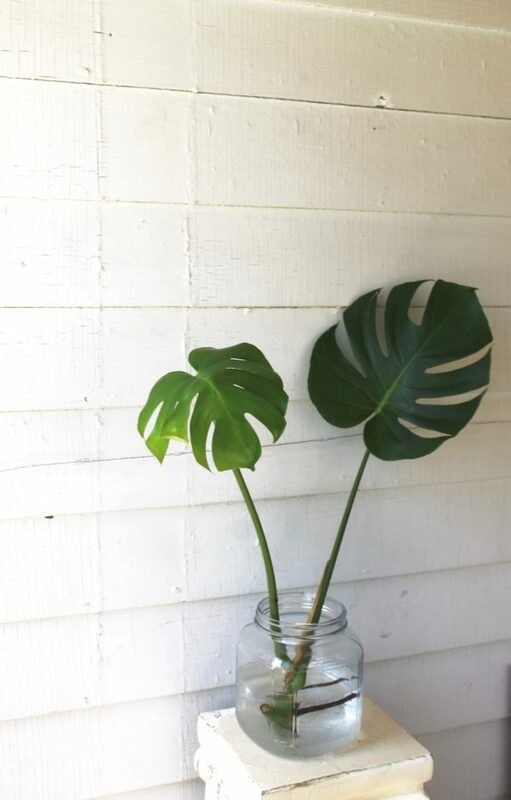 I have a question about the Monstera that I can’t find anywhere on the internet. I was hoping you could help me out. We bought a Monstera Delicious like a month ago. The first new leaves had many holes in them, but now all the new leafs are just plain leaves without holes. I thought it had something to do with too much / too little sunlight, but I can’t find anything about it. Hi Lynn! I actually just wrote a blog post about this! Here’s what I found out: Since Monsteras grow along and up trees, so, primarily in shaded areas, these holes allow sunlight to pass though to the base of the plant for photosynthesis / energy. Hole-lier leaves tend to be bigger, which have more surface area to grab sunlight – helping them as they grow vertically and closely against trees. These holes also allow rain to pass and trickle down to their roots as well. I see that your beautiful feline is in a lot of pictures with your monstera. 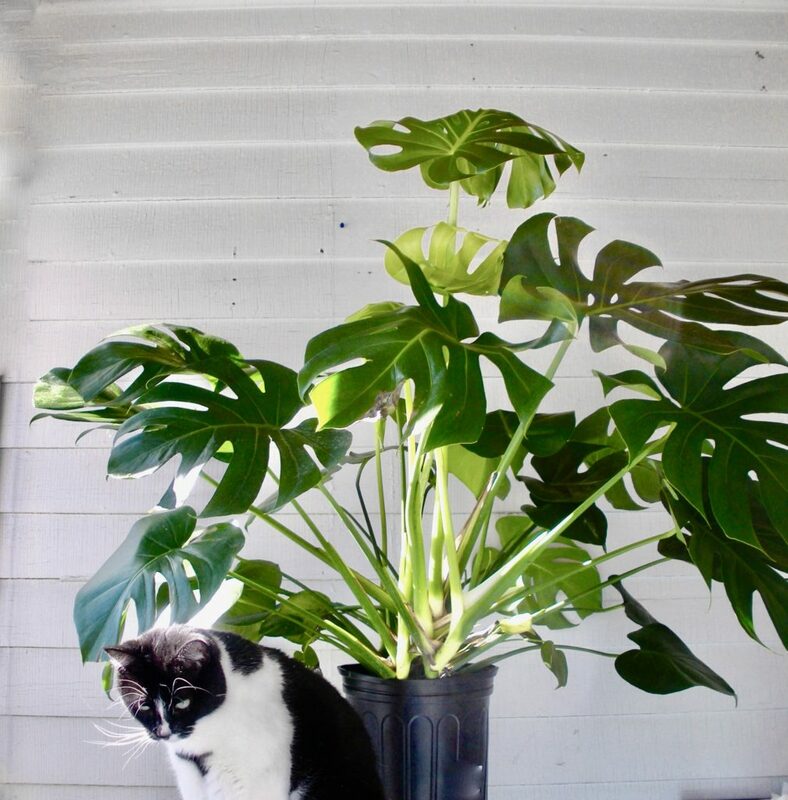 I was told and have read that monstera are poisonous for cats. Could you tell me about this if you know. I have a huge monstera and he is outside because I’m afraid for my 3 cats. Thank you so much! Hi Christine! They are *technically* toxic, but my cats in particular are not interested at all in eating them, which is only when they are considered dangerous. If you haven’t already, you can read my post about Monty, my Monstera here: https://leafandpaw.com/2017/03/21/indoor-plants-monstera/. I talk a bit about why I keep Monsteras in my home with cats. I hope that helps clear the air! Hi Candy – you’ll need a little black node on the stem, that’s where the roots grow from. So, you’ll most likely need another cutting if you only have the green stem. Good luck! Okay, so I live in Kauai and there are beautiful monsteras all over the island. There were too stems sort of loose so I grabbed those to take home in hopes they could grow some roots. But, if they are just the stems (no nub or ariel root) will that even be possible? Hi Emily – you are too lucky to live in a place with wild monsteras! As far as getting them to root, the stems won’t be enough – they’ll need a node which turns into the roots. You may need to get another cutting. Those stems will look great in a vase though! Hi! Thank you for this guide! I have two questions: 1. Is it possible to plant a stem and node directly into soil, or is it better to start in water? 2. What type of stake do you recommend? Is a piece of wood good enough, or should it be a moss totem? Hi Catherine! To answer your questions: 1. I’d definitely suggest starting in water to get the initial root going. Not sure if you would have as much luck just pitting them in soil. 2. I use just plain garden stakes like these: https://amzn.to/2M30TFt. Monty is about 5′ tall and I’m currently using 4-5 stakes to keep him upright. Plus I use them for all of my other large plants too. Thanks for reading! I currently have the roots in water and I have noticed some new growth, however with no leaf, will this still propagate? I feel good about it, but being such a rare find I figured I’d get as much input as possible! Ps, there is what looks to be the beginning of a new leaf, do you think this will continue to mature since it was uprooted? Can I have a cutting, too? Just kidding, but I’m looking for one if you find another! To answer your question, Tyler, I think you’ll be ok. A new leaf looks like a little fold coming from the stem, and that’s a good sign. I would keep it in water until a leaf completely forms and roots are visible. Were you able to get a node on the cutting? Hey there! My friend has a monstera, and when I asked for a cutting he gave me a piece of the root! I’m not quite sure what to do with it, or if I can even get a plant from this piece of root. Can you help? Thank you! Hi Samantha, all hope may not be lost! I would need to see a photo – that would definitely help me see if there’s a chance of propagation. You can post one on Leaf and Paw’s facebook page and I’d be happy to take a look! Thanks for the post! I have been propagating Monsteras for a little while now and am loving both the cuttings in the glass and my already potted rooted plants. My first question: I recently repotted some rooted Monstera plants, but decided to put them in separate pots. Now I realize that I could have planted them in one larger pot and had a bit bushier set up! Would it stress the plants too much if I repotted them again now? Hi Julia! As long as the weather is warm where you live and the monsteras are out of their winter dormant stage, it would be fine to replant/consolidate. To answer your second question, I just use an organic indoor plant soil with a bit of perlite/orchid mix and rocks at the bottom of the pot. All of my monsteras are happy with that mix. The lava rock may be a bit much in my opinion, so I would suggest reporting in something like a plain indoor plant mix (you can add the extras I do too if you like). Hope that helps and thanks for reading! My Monstera deliciosa went vertical and not horizontal. I have a single stem probably over 2″ in diameter with a height of almost 8′. I was reading that is the way they grow in the wild in order to climb up trees to reach the sunlight. Hi there! I am super worried. I have been looking for this plant for a while without success, until I went to an appointment yesterday and I noticed this huge Monstera! The person gave me a cutting with a huge leaf, but I realized after coming home that there is no node on it. He cut it at the base where two stems were growing but there is no node. I put it in water but now after reading online I am super afraid it won’t do anything, and I am not sure I can ask for another one…. is there any hope? Hi Catherine! Don’t lose hope yet – you might actually be fine. I would place it in water for a few weeks and see if anything happens. If I’m picturing how your cutting looks (feel free to post a pic) a node should pop up and develop. If it was cut too close to the base you won’t have any luck. If you can’t attach a photo in the comments here – feel free to post on Leaf and Paw’s facebook page and that would give me a better idea. Either way, place it in water. Good luck! I have a Monstera cutting from months ago that I had kept in water. It has many many roots now! When is a good time for this leaf with roots to be planted into soil? I have an indoor monstera that looks like Monty. I’ve been reading that I should stake it but I would prefer to just keep it bushy rather than grow taller. Do I need to stake it or can I just prune to keep it under control? Hi Anna, I’ve done both. Monty is very much growing horizontally and staking actually does encourage vertical growth, but pruning the awkward stems did help shape him a bit better last year. I have about 4-5 stakes to keep him somewhat vertical and plan on pruning the unwieldy stems come spring. If you do decide to prune, wait until it gets a tad warmer, like 70 degrees or so, since he’ll be able to recover better. Hope that helps! Hi can I just cut a stem at the base and put them in water? One stem and leaf? Not exactly sure where to cut? Hi Pam, Cutting a piece that includes the node (the little nub in the photos above) is the crucial part in propagating. So, just a leaf and stem probably won’t work out. Usually there is a stem that produces two leaves and at the base of that stem is the node – you’ll want to cut below that. 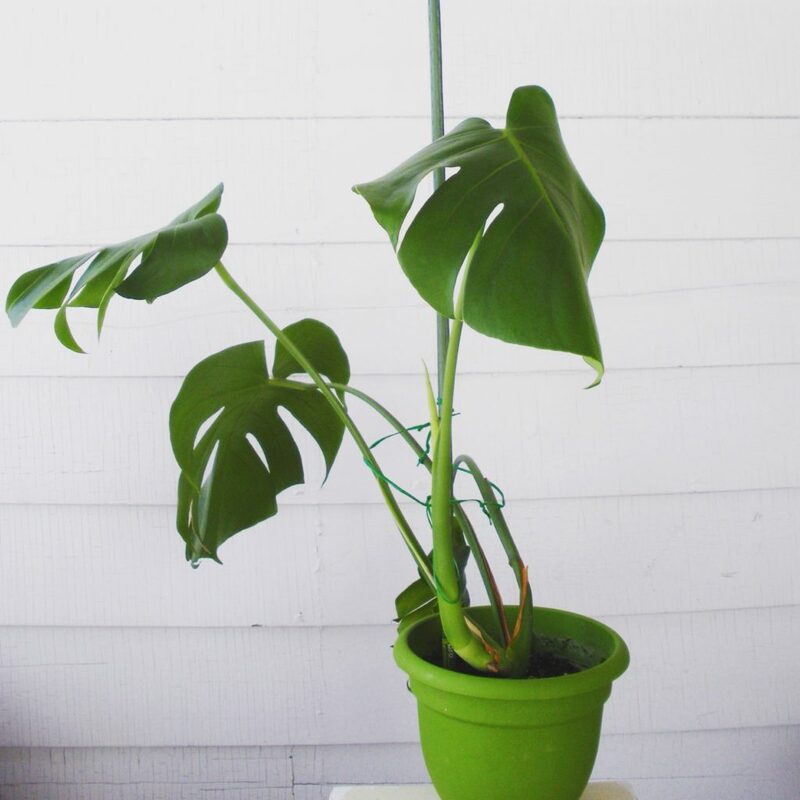 Feel free to post photos of your Monstera (either here or on leafandpaw’s Facebook page) and I’d be happy to give you more help!